A two-hour drive from Manhattan, The Emerson is an upscale getaway within the Catskill Forest Preserve. And it boasts an utterly unique attraction: The World’s Largest Kaleidoscope. In truth, it's a former silo repurposed as a mini-theater showing “kaleidoscopic” films. Right outside it is a kaleidophile’s dream: a shop/display area with everything from trippy tubes for toddlers to rare prismatic treasures to interactive, artist-crafted ‘scopes. As colorful as the kaleidoscopes are, the 53 rooms at the inn and adjacent lodge are subdued in hue and decor. Located on two stories, some rooms feature a loft-style bedroom and others offer a small balcony overlooking the region’s greenery. Especially romantic touches are in-room gas fireplaces and jetted bathtubs that can comfortably accommodate two adults. Among the shops at The Emerson is a small bakery that’s a fine place to pick up coffee and a croissant from 9 am on. (Rooms also include a Keurig coffee maker for early risers and DIYers). Or get a cone of locally churned Jane’s Ice Cream for a snack there. For lunch, try the nearby Phoenicia Diner, which draws locals and hipsters for its retro design. The diner is very popular on weekends and closes at 5 pm. There’s a dinner restaurant on the premises at The Emerson, but we didn’t have much luck there. Fortunately, there are some excellent restaurants in Woodstock, 20 miles away. Recommended are the Red Onion, New World Home Cooking for the award-winning spicy fare, and Joshua’s (especially popular with vegetarians). Also recommended: Pancho Villa's in Tannersville, where Tex-Mex dishes spice up the menu. Weddings and events can take place under two permanent al fresco tents (aka The Pavilion), capacity 150. They are set beside the resort and overlooking the Esopus Creek. The season for outdoor celebrations runs from May through October, and affairs can also take place indoors at the adjacent Catamount. Its larger room can hold up to 80 and its smaller one accommodates up to 60 people. Destination wedding couples and their guests can book rooms for overnight stays. There's also a spa with indoor and outdoor spaces. If you are interested in learning more about hosting a wedding at the property, you can start by filling out The Emerson’s online form. Couples who’d like to get married with minimal fuss and bother can opt for The Emerson’s Elopement Package, which enables you to create an intimate wedding day for the two of you. The Emerson Resort hosts both couples and families. Fortunately, it’s quite spacious — so it's unlikely you’ll feel crowded or irritated by guests’ children unless you use the swimming pool during the height of summer. On Friday and Saturday nights, bonfires are lit. Check the Specials and Packages page on the resort’s website to see what’s available when you want to visit. A babymoon package may include a discount on the room rate, in-room breakfast for two, massages for the mom and dad-to-be and other pre-natal pleasures. The Shops at the Emerson offer a well-edited array of local and high-end goods. There’s a country store that includes jams and jellies, housewares and candy, seed packets and greeting cards. It also features a corner for soaps and potions for the face and body. This repurposed barn also holds separate shops with clothing for men and women. In summer we were impressed by the number of breezy, gauzy printed tunics available for sale in the women’s shop and the large selection of outerwear by Barbour. We were a bit amused by the copious men’s ties on display, as this is not an area where men normally wear ties (except for funerals). The real draw, though, is the unique Kaleidostore; I dare you to come away without buying one. The Emerson encourages guests to spend time outside. When we pulled in, the daily morning yoga class (fee) was just starting in a shaded gazebo beside the creek. When it gets cold outside, classes will continue in a dedicated room the Garden Spa. In addition to the heated swimming pool, warm-weather onsite activities include badminton, volleyball, and fishing. And there’s a fenced-in dog run where your dog can frolic off leash (and he’s welcome as a guest of the resort). In winter, there’s onsite snowshoeing and cross-country skiing if the weather allows and the resort can outfit skiers and direct them to nearby slopes on Belleayre, Hunter and Windham mountains. The Emerson’s most recent addition is its spa, a spacious and serene space. The couples spa treatment room features a deep jetted Jacuzzi beneath a picture window in addition to two spa beds for treatments. The spa also has outdoor space and a jetted tub for the use of all clients. Aside from the nail salon, the spa is restricted to adults only. Two towns are worth exploring: Phoenicia, about three miles away, and Woodstock, twenty miles from the resort. Phoenicia is small, with just one main street. Lures include the Nest Egg country store, Sweet Sue’s (a popular breakfast place), Tender Land Home (a great place for gifts), Arts Upstairs (a gallery showing local artists), and Brio’s (a restaurant with a wood-burning pizza oven). Woodstock has a lot more to offer and is worth a visit, whether you want to shop, dine, visit galleries or just soak in the vibe. Couples who love the outdoors should head for the nearby Maurice D. Hinchey Catskill Interpretive Center in Mount Tremper. It’s the place to get trail maps, directions and use a clean bathroom before you head out on a trail. 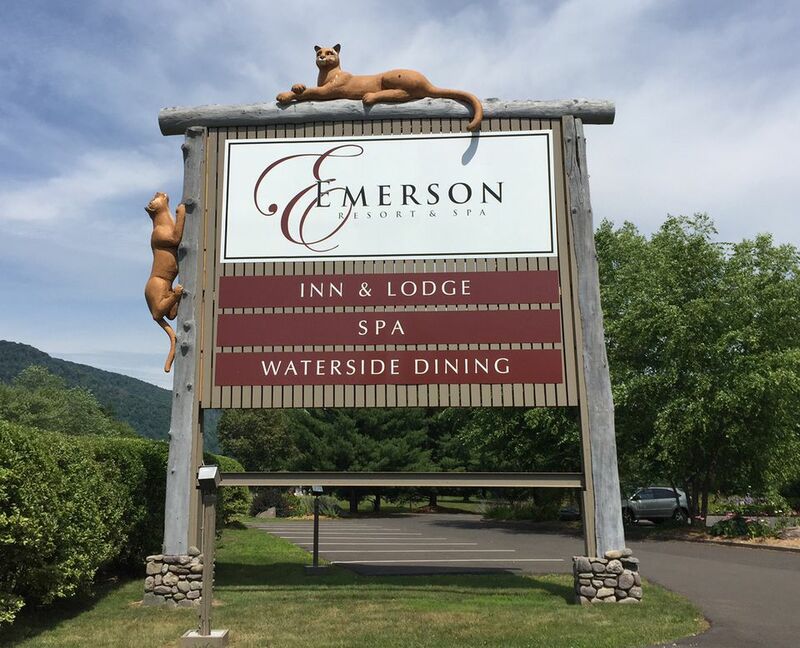 As bucolic as The Emerson appears, it is located directly on a major roadway through the Catskills. Cars whiz along two-lane Route 28 (speed limit is 55 mph), so it’s no place for an idyllic, hand-in-hand stroll beside the resort. You'll need to drive someplace if you want to go for a walk or hike. Despite bikes being available in the shop, the road is not advisable for biking as there are no dedicated bike lanes yet and what separates speeding traffic from bikers is a thin stripe of asphalt edged by swales. The Emerson is a laid-back place good for a long romantic weekend or a babymoon. Couples who revel in the outdoors but want a comfy king-size bed to repair to nightly, will find this property a fine perch for exploring the towns and trails, shops and restaurants of the Northern Catskill Mountains.